While analysts predict that revenue for the telecom industry will drop by 5% per year, drones may offer the companies a new revenue stram. Unmanned Traffic Management (UTM) systems will require consistent communication between drones and air traffic or other UTM services; the massive amounts of data generated by commercial drone missions needs to be communicated somehow – and telecom companies will reap the benefits. Grid operators are using drones on a growing scale to keep the grid up and running, moving from a reactive maintenance model to a preventive maintenance model. Using drone monitor vegetation growth, identify failure modes, and create preventative maintenance plans. 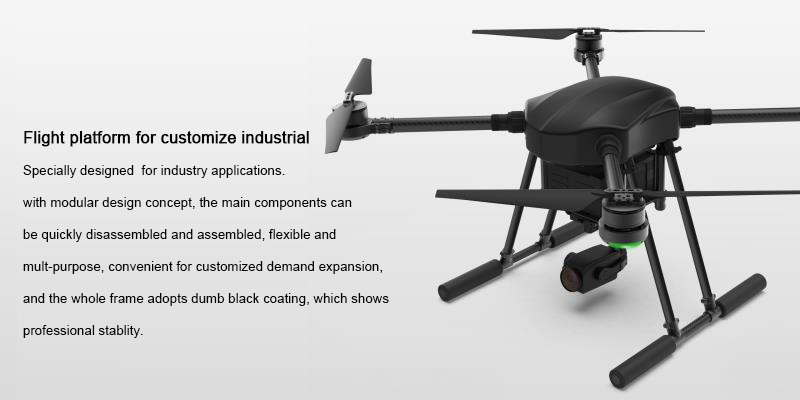 Customize Industrial Drone frame with rotor, 1-5KGS payload for camera and other equipment. Flight platform for customize industrial Specially designed for industry applications. with modular design concept, the main components can be quickly disassembled and assembled, flexible and multi-purpose, convenient for customized demand expansion, and the whole frame adopts dumb black coating, which shows processional stability.